When the laws surrounding scattering cremated remains in Illinois changed, innovative new methods emerged in Chicago for implementing them. 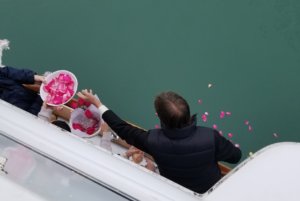 Now that ashes are required by law to be scattered 3 miles offshore in Lake Michigan, Adeline’s Sea Moose rose to the challenge and providing one of the best places to scatter ashes in Chicago. 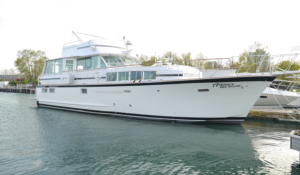 Adeline’s Sea Moose is the only vessel that’s licensed in Chicago to charter 3 miles offshore. This exclusive status makes us the perfect way to legally perform maritime memorials on Lake Michigan. The days of limited options are over, so give your loved one the luxurious farewell that they deserve. To ensure that our clients get the proper closure, we provide the perfect setting for scattering ashes in Lake Michigan Chicago.There’s something undeniably soothing about having the Chicago skyline contrasted by the opposing horizon on the open water. Our 68-foot vessel offers a large enough deck to comfortably host 45 family members or give you some necessary privacy. The main advantage of this duality is it allows guests to avoid the inconveniences of sharing a conventional wake with strangers. When performing a Burial at Sea with Adeline’s, no detail is overlooked. Everyone mourns and says goodbye in different ways, which is why we keep our ceremony options as fluid as the water we sail on. Each service is unique, and our long list of amenities can be tailored for each guest. We offer intricate flower arrangements, music playlists, urns and even white dove releases that can all be captured on drone video. Our hard cover remembrance books ensure that the memory of both the ceremony and person’s life is properly preserved. 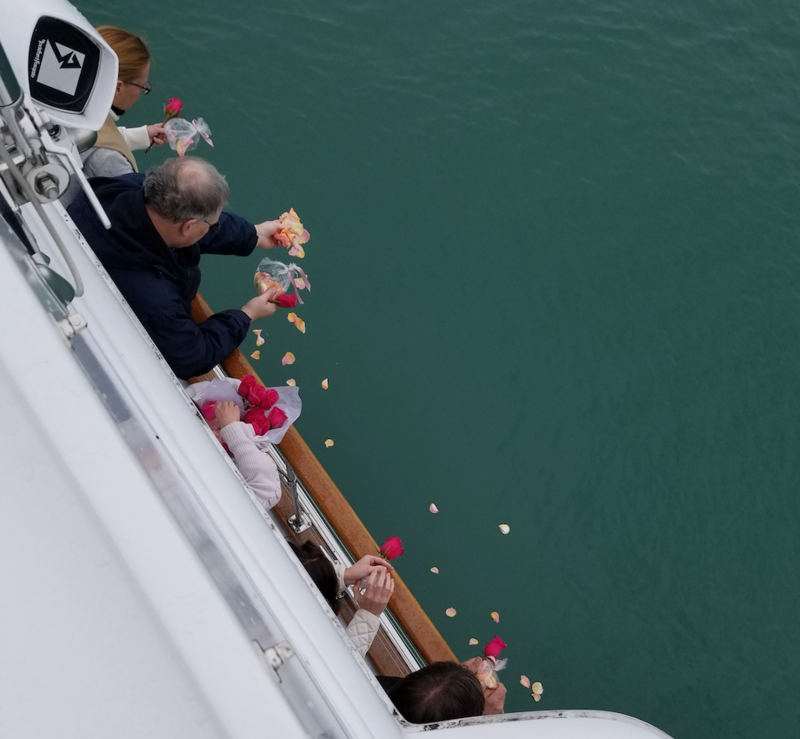 Instead of turning to scattering gardens in Illinois, families are looking to scatter ashes in Lake Michigan Chicago to honor their loved one’s life. We understand that each wake is a personal experience, which is why we provide multiple service options. The diversity of our packages allows clients of different traditions, wishes and budgets to perform the ideal ceremony. To highlight what’s available, we compiled a list of the three main packages we offer. Adeline’s completely complies with Illinois law scattering cremated remains, which is why now is the time to coordinate. Our event coordinators are available to walk you through the entire planning of your ceremony charter. Option #1: Family & Friends Ash Scattering Cruise –This elegant voyage is an exceptional way to conduct a maritime memorial. 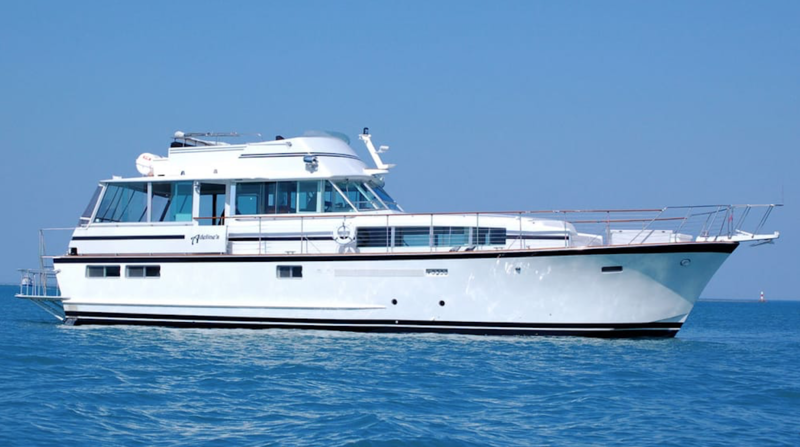 After boarding our yacht at Burnham Harbor, up to 45 guests can join us as we set sail for Lake Michigan. Once we reach the site, the service will be conducted as requested by a chaplain or captain. Our staff offers a compassionate approach to every ceremony, which allows us to complete any reasonable request. What makes this option so appealing is its versatility. 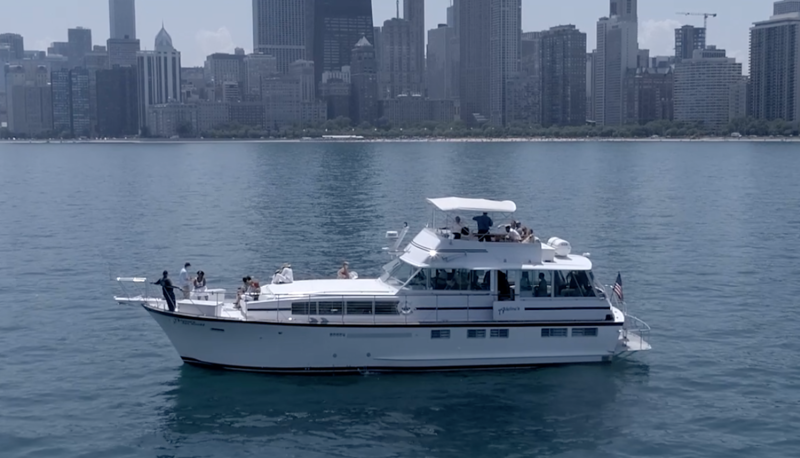 From smaller groups to larger families, our yacht provides the best of both worlds. This level of intimacy is complimented by high-end catering options and beverage packages. Whether you want to celebrate your loved one’s life or usher in this moment in silence, Adeline’s has you covered. There are multiple ways to complete last wishes, so contact us with your wises. Option #2: Unattended Ash Scattering Service –In this day and age, not everyone is available to attend the final ceremony. That doesn’t stop us from providing closure with this surprisingly popular burial option. Once we receive the ashes, they are scattered between 7 and 30 days of receipt. Just like our other options, all requests are honored. From prayers to blessings, every aspect of the ceremony is documented by our talented photographers and drone videos. The burial spot is marked by GPS, which allows clients to come pay their respects at any time after scattering ashes in Lake Michigan Chicago. 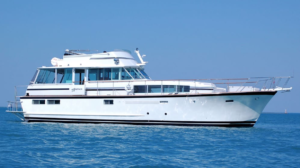 Option #3: Veteran’s Ash Scattering Service –No other yacht company in Chicago has as much admiration for our military as Adeline’s. To showcase our respect, we offer a unique option that’s exclusive to servicemen and women. This package can be performed with family and friends as well as unattended, which makes it the most flexible option on our list. The scripture, prayers and benediction can be closed with three volleys and a salute. Military discounts are available upon request, so contact our staff to create the perfect heroes’ farewell.